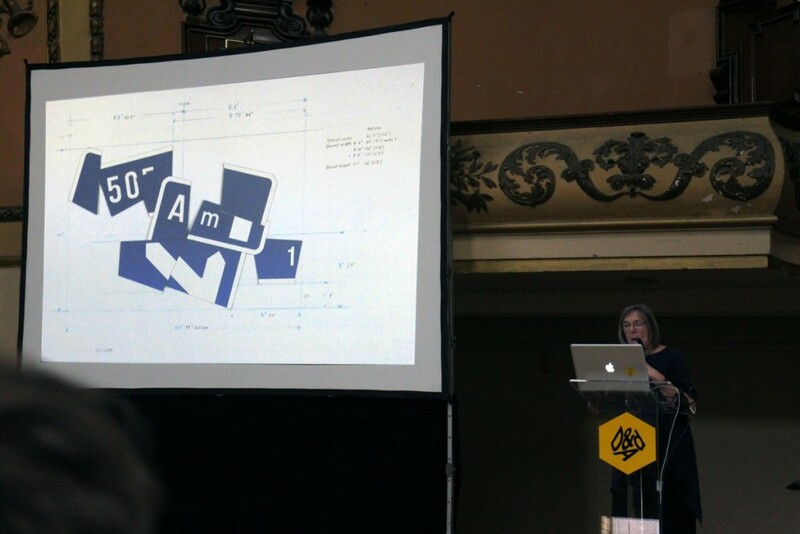 It’d been a while since I attended the last D&AD talk by Ben Trickleback in March. 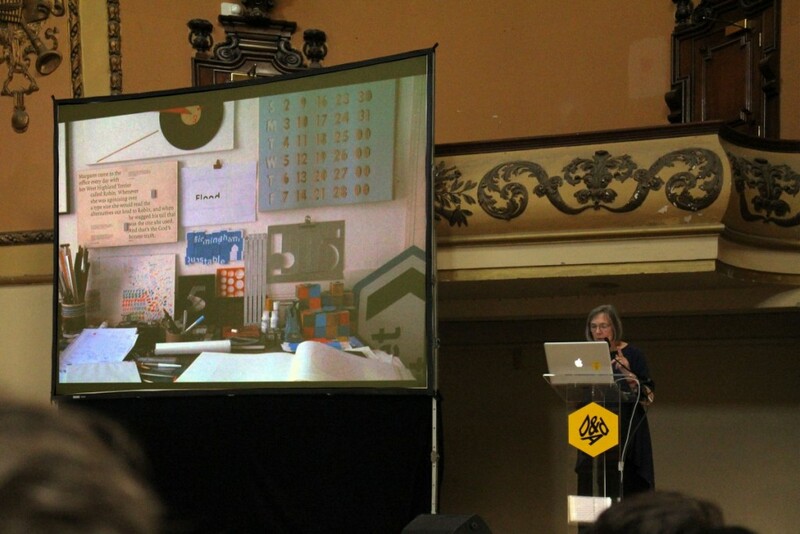 It was the hottest day of the year, Wednesday 1st July, and about 1000 people sat in Shoreditch Town Hall eagerly waiting to hear from one of the biggest names in Graphic Design; Margaret Calvert. Everyday UK residents come into contact with Margaret’s work without even knowing it; passing, reading and using it to navigate their way around Britain’s roads. As the saying goes ‘good design is transparent’, and for a lot of people road signs are essential but go completely unnoticed. Alongside Jock Kinneir, Margaret made a name for herself developing signage, but that was back in the 1950’s so what has she been up to since? Margaret shared an image of her desk, explaining that it’s where she’s most comfortable. I love looking at creative’s spaces and Margaret’s, decorated with lots of cool design bits, is just as I expected; eclectic and ordered. I’d never really thought about Margaret’s route into design, but I was surprised (as I’m sure many other are) to hear that she studied Illustration at Chelsea College of Art. 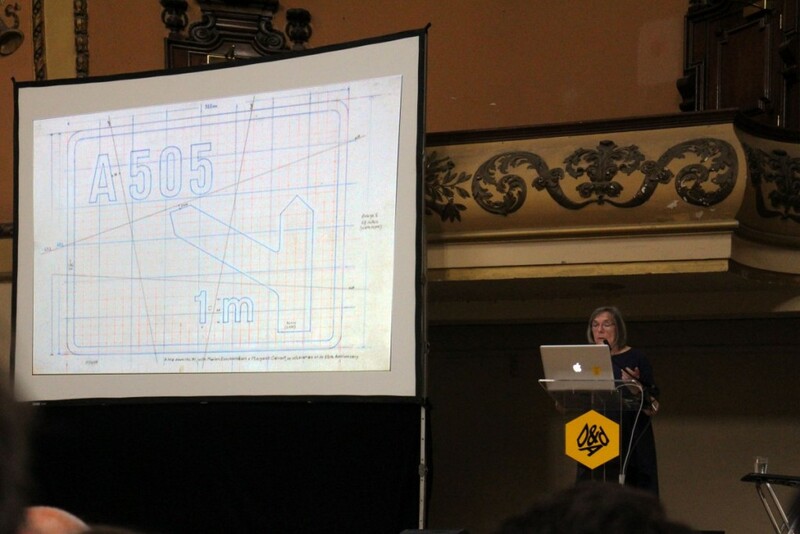 I guess from seeing her crisp, gridded and mathematical inspired road signage and fonts, I didn’t see Margaret to be as experimental as an illustrator. After leaving CCA, Margaret struggled to know what to do next; ‘What the f**k do I do now?’ – something which I totally relate to. 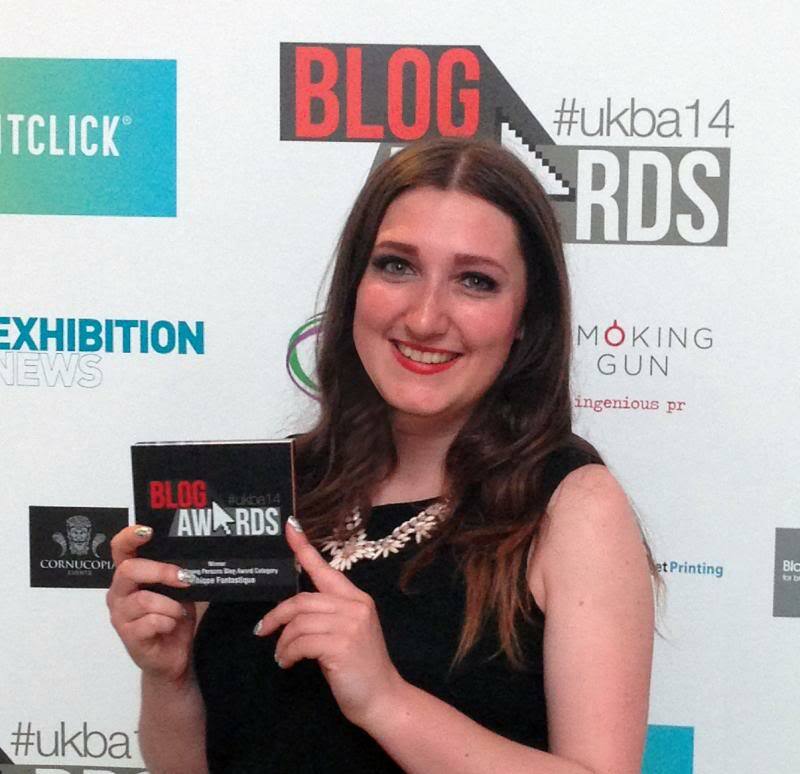 Her enthusiasm for packaging earned her an invite from visiting tutor, Jock Kinneir, head of signs for Britain’s roads who was looking for an assistant. And the rest is history! 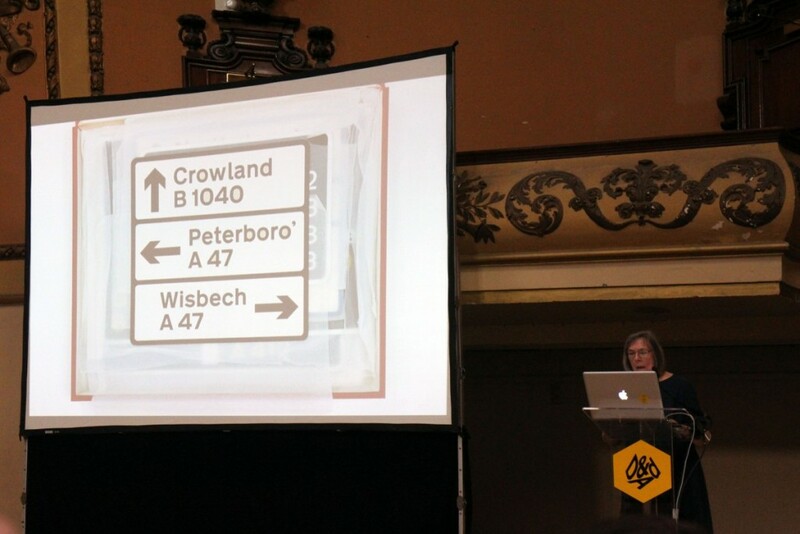 The duo revolutionised and streamlined signage across the UK, from steep hills and roundabouts to farm animals(based on a cow named Patience that lived on a farm near to where she grew up) and train crossings. ‘You have to remember that this is a time before computers’; Margaret was keen to remind us all that everything was drawn and painted by hand. All of the signs; letters, lines and shapes. Flicking through an assortment of signs, I was excited (I’m such a geek, I know) when Margaret stopped on the above sign which is from my hometown area. The reason that she had stopped on this sign was to share a that someone forgot to cut out the middle from the zeros in Crowland’s road number. It’s quite subtle but now that I know I can tell, can you spot it? Margaret blamed her assistant, to which everyone laughed. You’d probably laugh if you heard anyone else say this, but Margaret confessed; ‘I like to draw the letters back to front so that I get a feeling of the letter.’ Thinking about it, it’s actually a good idea because you start to look at the letter as a shape rather than a letter and can focus on the form without distractions. 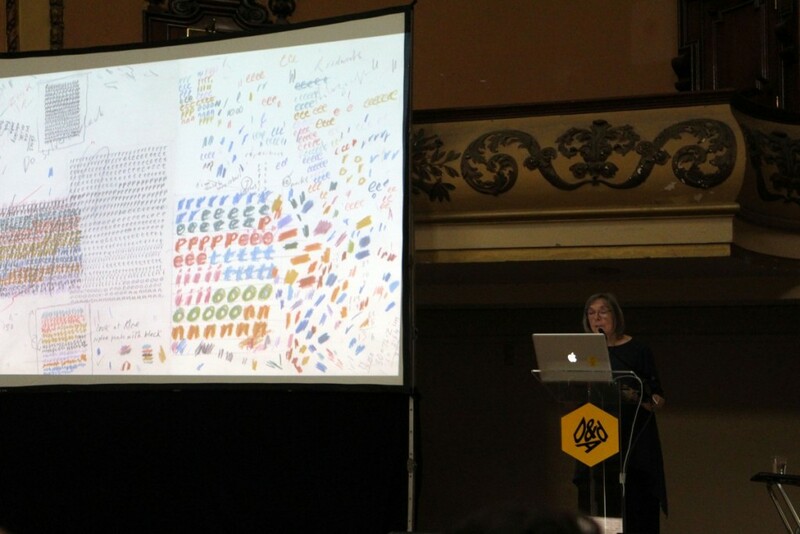 But it’s not all about letterforms for Margaret, she gave us a peak at ‘the stamps that never happened’ – a trio of stamps including an artificial shadow. 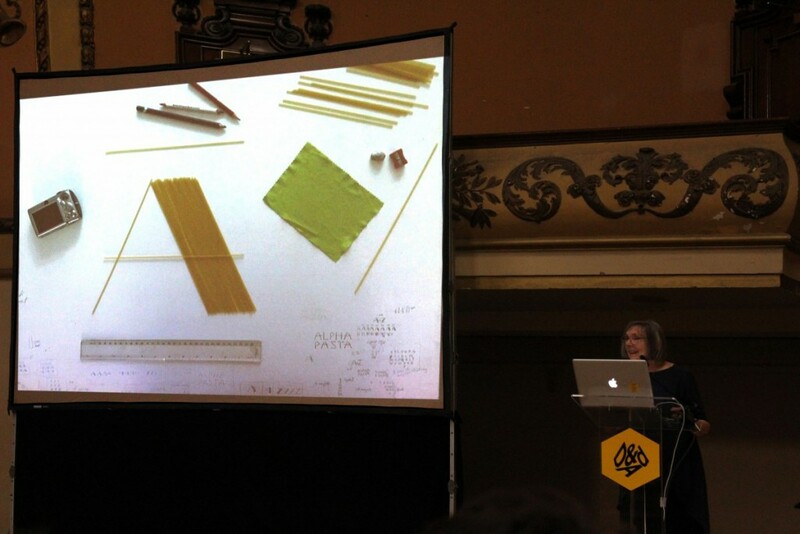 Margaret shared her latest creation simply entitled ‘alpha pasta’, and said she is ‘looking forward to creating italic. How do you create the italic weight? Cook the pasta!’ She has been working towards digitalising it too, with the help of Henrik from A2. So what’s next for Margaret? This year marks the 50th anniversary of the road signage system, with an exhibition being held at Sheffield’s Made North Gallery. 50 artists and designers will showcase their own versions of the road signs including Mark Bonner, Spin and Jonathan Barnbrook. 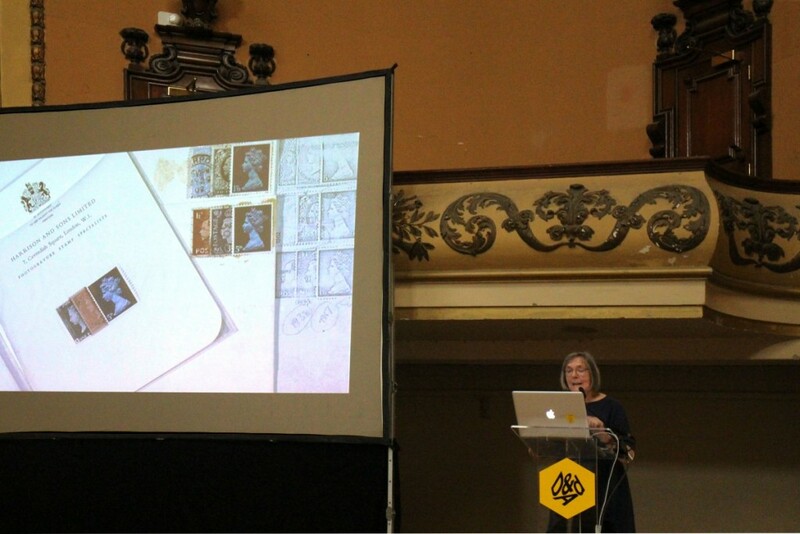 Read more anecdotes from Margaret and about the exhibition in this Design Week article. 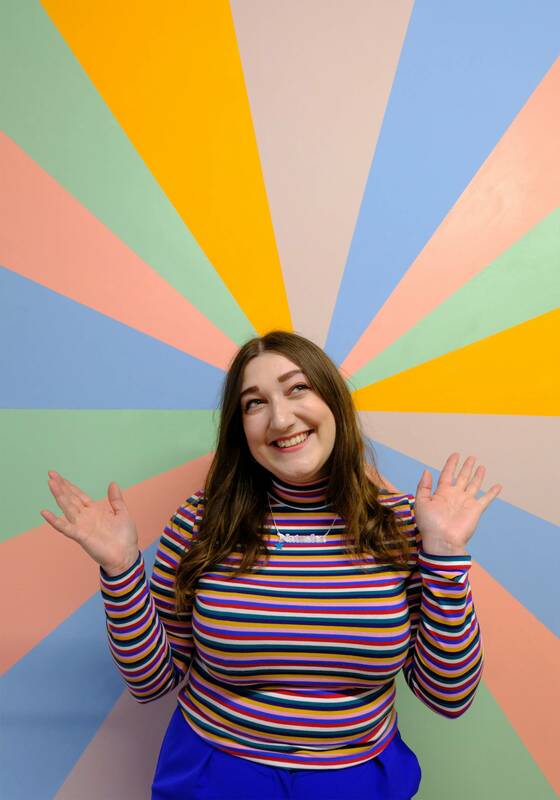 I really enjoyed hearing her talk – I think she has a lot of personality and a good sense of humour, and the laughter and applause from the rest of the audience would suggest I’m not alone. 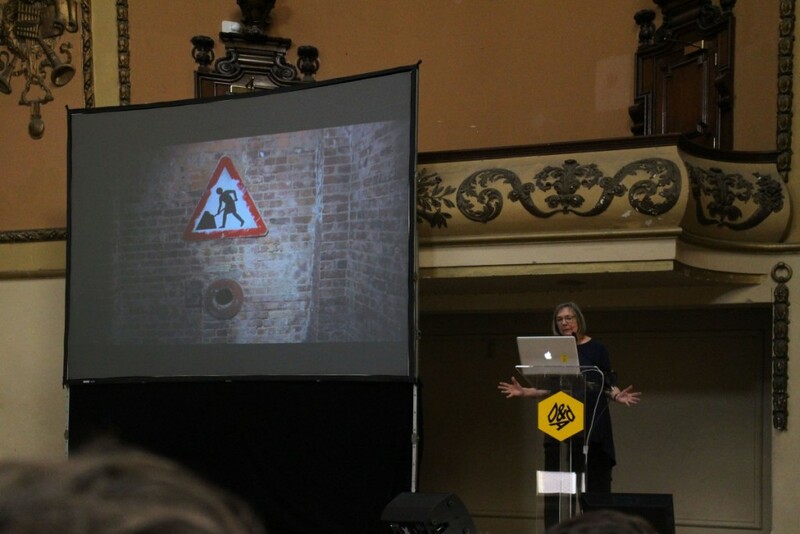 Thanks to D&AD for putting the talk on – I don’t think Margaret does a lot of talks (in fact I think I remember her saying that she never does talks?) so I felt quite privileged to get an insight into her life.